Corals in shallow waters glow because of fluorescent proteins that act as sunblock, protecting the endangered species from the sun’s intense rays. Now scientists from the University of Southampton have found that corals in deep water are fluorescent for the exact opposite reason – to absorb the little light there is for the benefit of photosynthetic microorganisms that provides most of the coral’s energy needs. The group is displaying their research at this year’s Royal Society Summer Science Exhibition and publishing their work in this week’s issue of Proceedings of the Royal Society B.
Corals and microscopic algae called zooxanthellae, have a mutually beneficial relationship where the tine algae gain shelter, carbon dioxide and nutrients while corals get photosynthetic products that can provide them with up to 90% of their energy needs. Sunlight is one of the most important resources symbiotic corals need to survive, yet they can be found ranging from shallow waters where sunlight is abundant to water as deep as165m, where little sunlight reaches them. The little light that does make it this deep is almost all in the blue spectral range, the other colours having been reduced in intensity by the water column. Too much sunlight is not only a bad thing for humans but for corals as well. 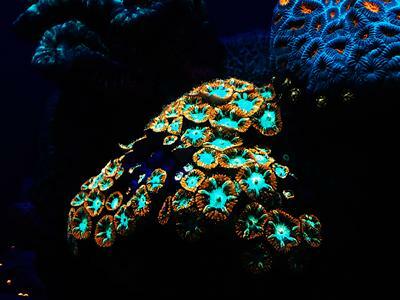 Some shallow water corals produce fluorescent proteins to block excessive sunlight that could harm the zooxanthellae. However, this doesn’t explain why numerous corals in deep waters are also brightly fluorescent. Working in collaboration with scientists from the Interuniversity Institute for Marine Sciences of Eilat and the University of Haifa, Israel, researchers from the University of Southampton set out to resolve why deep water corals glow. They analysed how well different light colours spread through dense layers of zooxanthellae, the symbionts that are vital to coral survival. They found that corals survive in deep water by making a special type of fluorescent protein that captures blue light and reemits it as orange-red light, which has the potential to penetrate deeper into the coral’s tissue and promotes the photosynthetic capacity of the zooxanthellae. The team also simulated deep water light environments in their experimental coral aquarium and found that brightly red fluorescent corals had a better chance of survival in the long run compared to their non-pigmented counterparts. This matched the distribution of corals in the Red Sea, where the team found that corals with these special red fluorescent pigments became more abundant in deep water. Aside from lending the stunning colours to corals, fluorescent proteins also have important applications for human health. By glowing green, yellow and red under a blue light, these proteins enable scientists to make important discoveries in cancer and HIV research by lighting up living cells so they can be seen under a microscope. Scientists are on the hunt for new fluorescent proteins, particularly those glowing at the far-red end of the light spectrum which are easier to detect than green fluorescent proteins in tissue made up of many cell layers. Visitors to the Royal Society Summer Science Exhibition will be able to learn about the value of fluorescent corals, anemones and bio-engineered bacteria at the Glowing Corals exhibit on 4-9 July 2017.